When Megan Thomson was 30 weeks pregnant, an ultrasound revealed that her baby had a mass on his face that could dangerously obstruct his airway after birth. Thomson’s care team at U-M C.S. Mott Children’s Hospital, which included Glenn Green, M.D., faced the question of whether the baby could be delivered safely through a C-Section, or whether an Ex Utero Intrapartum Treatment, or EXIT, procedure, in which surgeons would perform a tracheostomy during birth, would be necessary. To help answer that question, Green turned to a colleague, Scott Hollister, Ph.D., a U-M professor of biomedical engineering and mechanical engineering, who runs the university’s 3-D medical printing lab. Green says the ability to create such detailed 3-D models of patients’ anatomy can help physicians in their clinical decision-making and diagnoses. The 3-D fetal head model maintained the specific anatomical structures of the baby’s face, which allowed him to see that there was no impingement on the airway. He was confident that the baby could be delivered without needing the EXIT procedure. Cases like these continue to prove the unique potential of 3-D printing to impact medicine. In collaboration with Green and other physicians, Hollister’s 3-D printing lab has built models and implantable devices for many different types of patients. These include: trachea splints for tracheomalacia, a disease that involves the collapse of a pediatric patient’s airway; patient-specific Continuous Positive Airway Pressure, or CPAP, masks for children with craniofacial abnormalities; and shape memory materials that could be potentially delivered via catheter to treat heart defects. With the ability to create precise and accurate models, like the fetal head, based on patients’ individual anatomy, 3-D printing is being used more and more for surgical planning and simulation. Not only are surgeons able to practice complicated procedures before their operations, they’re also able to teach residents how to operate. Additionally, the specificity of 3-D printing allows engineers to create customized devices for patients who aren’t well served by larger medical device manufacturers, especially pediatric patients who have a much greater variation in size and anatomy. 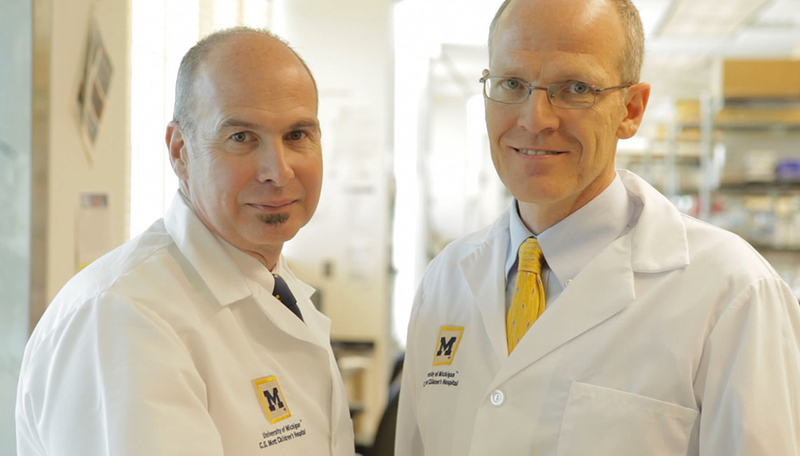 Hollister and Green envision an FDA Good Manufacturing Process, or GMP, approved lab at U-M that could handle everything from patient-specific design and modeling to building 3-D models, creating implants and eventually regenerative medicine applications. This project is in the very early phases as it will require significant space, equipment and personnel to run it. But, for their part, Green and Hollister continue to prove the value 3-D printing brings to medicine and biomedical engineering. The scrapbooks of Frederick A. Coller, M.D.